The first day was determined by my biggest personal challenge; driving. Not that I am not used to driving generally, I totally am, but not on THAT side of the road! It caused one or two sleepless nights beforehand, much stress and the very honest fear of causing a mortal accident. Luckily my travel companion was less of a nervous wreck and nailed it like a boss. After some observing I dared to take the steering wheel, took some sidewalks, caused 1 or 2 almost crashes but we got out of it just fine, and the other car as well. Seriously. As we arrived in Belfast only in the afternoon, it took us the entire rest of the day to reach our first destination: Ballycastle. We booked a room in The Avenue B&B and it turned out to be a very good choice. Our host Caroline and her husband were very welcoming, friendly and so helpful, that we even got a ride down to the pub! Considering her knowledge of the area and the excellent breakfast she served (with mainly local products), it wasn’t a surprise to learn that she is the head of North Coast Walking Tours and organizes food and walking tours around Ballycastle. Unfortunately we had no time to take a tour with her, but I hope we’ll come back to learn more about what this area has to offer because everything we’ve tried was delicious. From Ballycastle it was only short distance drive to the top sights, The Dark Hedges The Kings Road, The Giant Causeway and Carrick-a-Rede Rope Bridge. We followed Caroline’s advise and headed early over to the Dark Hedges, to be there before the tourist buses from Belfast. I have to admit, as a Game of Thrones Fan, I did get shivers and I could picture only too well Cat or Rob Stark riding along. After taking the obligatory pictures we drove further to the Giant Causeway, one of the world heritage sites. 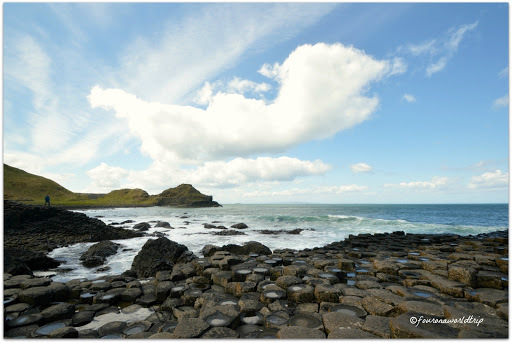 The more than 40.000 basalt columns are mainly of hexagonal shape and were built -obviously- by the giant Fionn mac Cumhail, who created the Causeway across the north channel to fight the scottish giant Benandonner. We recovered quick from the shocking parking place prices and got rewarded with the absolutely stunning views and walks around the Causeway. It wasn’t overly crowded and to be honest, I was deeply impressed. I felt (and still feels) grateful that I was allowed to see something so precious and grand. Something I did not feel at the Carrick-a-Redge Rope Bridge 😀 It was a nice walk (quite exhausting though) along a beautiful coast with steep cliffs and long waves, but the bridge, well, it´s a bridge. And everyone wants to get on it. It`s still worth a visit, especially when traveling with kids, but when still being stunned by the Giants Causeway, everything that comes after appears probably a bit lame. 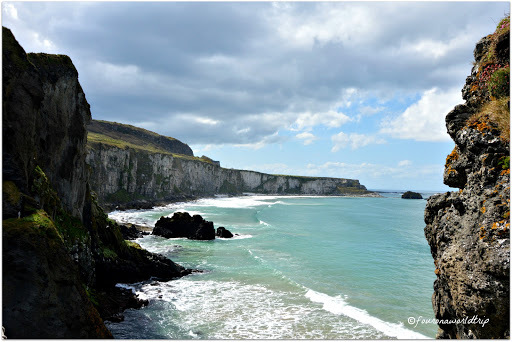 … until then, check out this wonderful video about the Causeway Coastal Road – formerly known as the Antrim Coastal Road! 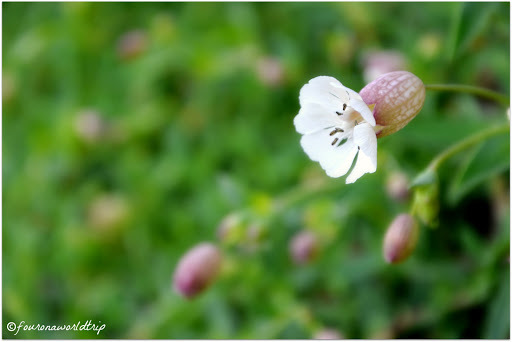 Those pictures are gorgeous! And that sheep! I want to hug it so bad. I'm hoping to make it to Ireland in 2017 but we shall see! I can’t believe you took a photo from that bridge. It was very windy on the day we went across and I was still shaking when drinking a much needed Guinness a couple of hours later!